Workers at a Suniva factory. The Georgia-based manufacturer has caused a stir in the solar industry by requesting that the Trump administration raise tariffs against imported solar cells and modules. Photos courtesy of Suniva. Until two weeks ago, the solar industry was in a generally celebratory mood, flush with good job numbers and installations doubling year over year. Then the Suniva news hit. That morning, Suniva Inc., a solar manufacturer based outside Atlanta, filed a petition with the U.S. International Trade Commission (ITC). Having declared Chapter 11 bankruptcy just a week before, Suniva said the company would perish for good unless the government immediately imposed tariffs on solar cells and modules imported from around the globe. Suniva invoked a rarely used law, setting in motion a chain of events that could leave the tariff decision — and the momentum of the entire solar industry — squarely in the hands of President Trump. A lot of solar people are worried. "It is, front and center, the biggest uncertainty within the industry," said Barry Cinnamon, who owns a solar-installation business in California and is an alternate board member of the industry's principal group, the Solar Energy Industries Association (SEIA). "One of the reasons it's of such concern is that it could end up being decided on a political basis, and it's very hard to tell which way the solar winds are blowing in Washington." Suniva's complaint sets up a decision with momentous implications. For the energy industry, a decision by Trump in favor of Suniva could make a dominant form of solar power far more expensive and chill the industry almost overnight. For those with a stake in international trade, it will be an up-or-down test of whether Trump follows through with his protectionist rhetoric. Suniva sees itself as taking a last stand, as one of the remaining domestic makers of photovoltaic technology that was invented in the United States. With good reason, it claims that its Asian competitors have dodged U.S. trade protections by shifting production to third countries. It argues that only a blanket tariff will save U.S. solar manufacturing. Meanwhile, the rest of the industry — other manufacturers, suppliers, project developers and installers, which collectively employ hundreds of thousands of people — have relied on those same imports for their precipitous growth. And they stand to lose big if trade barriers go up. "We acknowledge the complexity of this issue," Abigail Ross Hopper, the CEO of SEIA, said in an interview. "We have 250,000 workers, thousands of companies, and anything that puts that industry at risk is a threat." "On the other hand," she added, "we believe in domestic manufacturing." Under a normal presidency, the sheer strength of solar's jobs numbers would give the industry confidence that the concerns of its many would outweigh those of a few. But Trump's priorities make Suniva's petition a wild card. Privately, solar advocates say they fear that Suniva's case could provide an opportunity for Trump to look tough on trade while also inflicting serious harm on solar, which could aid his efforts to roll back energy regulations and nurture the coal industry. "Thank you, Suniva, for giving the Trump Regime a potentially great weapon to significantly curtail solar deployment in the US!" one reader commented after reading a story about the topic at Greentech Media. 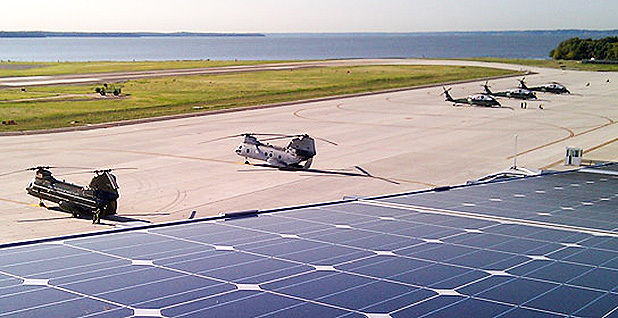 Suniva's solar panels have been used by many arms of government, including at a hangar for Marine One, the president's helicopter. Photo courtesy of Suniva. The rub is that the forces that have led to the near-demise of U.S. solar cell and module manufacturing are the same ones that have made the other parts of the industry so successful. The type of solar Suniva produces is crystalline silicon photovoltaic (CSPV) panels, which are the type found on most rooftops and at most utility-scale solar farms. In its filing, Suniva laid out a detailed case explaining how Asian companies undercut the few remaining U.S. manufacturers by offering rock-bottom prices amid a global supply glut. Suniva said that a worldwide barrier is needed because earlier tariffs, imposed on China and Taiwan in 2012, had failed. China, the petition argued, simply moved its operations to other countries, including Thailand, Malaysia, Vietnam and Canada — but not to the United States. "The global industry has proven, to the sum of billions of dollars in investment, that it will go to exceptional lengths not to invest in the United States, and that given any loophole, it will pursue that loophole vigorously," Suniva's petition said. 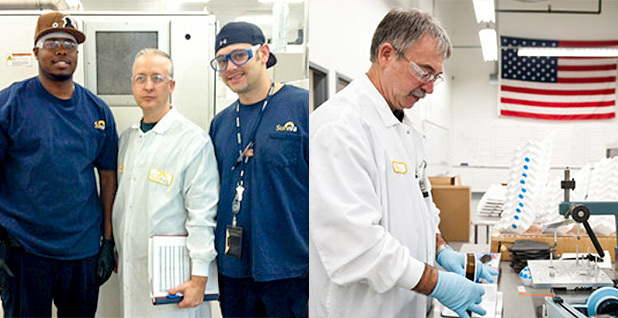 In December, Suniva completed an expansion of its factory outside Atlanta that doubled its output. But just months later, plummeting prices for cells and modules left it in a cash crunch. The petition asks the ITC to place a duty of 40 cents on solar cells, which are 6-inch squares of solar material mostly composed of silicon. It also asked for a floor price of 78 cents a watt on solar modules, which are made up of solar cells. The tariffs would last four years and be stepped down a few cents per year. Since making a forceful case for tariffs to the ITC, Suniva has been mostly silent and made no spokesman publicly available for this story. If it has allies in the solar industry, they have not yet made themselves known. Saving jobs, or destroying them? Meanwhile, other segments of the solar industry have reacted with dismay. "It looks pretty damaging. It looks like it would set us way back," said Mark Richards, a senior vice president at Intermountain Wind & Solar, a leading solar installer in Utah. Intemountain's projects take a long time to develop, he said, and if tariffs arrived between when he promised solar panels and when he delivered them, the effect on his bottom line would be "devastating." Analysts have said that Suniva's proposed tariffs would essentially wind back the clock on solar prices by several years, before price drops made solar competitive with other sources of electricity on the grid. Those higher prices, in turn, could threaten solar's soaring job growth. The sector employed 260,000 Americans last year, providing 1 out of every 50 new jobs, according to the National Solar Jobs Census. Solar now employs more people than any part of the energy industry except for the oil and gas sector. Higher prices would likely slow the rapid uptake of residential rooftop or commercial solar installations, which would have an outsize impact on jobs. More than half of the jobs in solar, 137,000, are in installation. But the biggest impact could be on large utility-scale solar projects, which are built with thin profit margins as developers compete with natural gas power plants at a time when gas is abundant and cheap. Rhone Resch, a former president of SEIA, was quoted by Greentech Media that Suniva's proposed tariffs could double the price of a solar power purchase agreement, which is the framework that most utilities use to buy solar power. "You will have several gigawatts of potential demand erosion," Resch said. Protecting Suniva's part of manufacturing — cells and modules — might save the 2,000 to 4,000 jobs in that sector and prevent an important part of the domestic solar supply chain from being snuffed out. On the other hand, the United States has far more manufacturing jobs that involve using imported cells and modules to make solar panels that are in other ways American made. Solar manufacturing overall employed 38,000 people last year, according to the National Solar Jobs Census, and that number has been climbing rapidly as imports have cheapened. Among Suniva's detractors was a founder of one of the U.S. solar manufacturers that went bankrupt in the midst of a prior wave of cheap Chinese product. "The precipitous decline in solar hardware prices (that put Evergreen Solar and hundreds of other Western companies out of business) has led to remarkable growth of the market, producing hundreds of thousands of US jobs and GWs of installations. Trade barriers risk derailing that progress," Mark Farber wrote in an email. Farber co-founded and led Evergreen Solar, which went bankrupt in 2012. For Suniva to persuade the ITC, it must prove it represents an industry. One danger sign for Suniva's case is that the only other surviving American producer of CSPV cells and modules, SolarWorld, has signaled that it's not on board. SolarWorld, the U.S. subsidiary of a German company, led the complaint that led to 2012 tariffs. In a statement, its president, Juergen Stein, said that Suniva's ITC petition "dramatically demonstrates that the U.S. solar manufacturing industry still suffers from unfair trade" but added it "prefers that any action to be taken against unfair trade shall consider all parts of the U.S. solar value chain." Higher prices on imports would result in some other winners; for example, it might be a boon for makers of thin-film solar, like Arizona's First Solar Inc., because their technology is not covered by Suniva's complaint and their product would have an immediate price advantage. Suniva filed its petition with the ITC under Section 201 of the Trade Act of 1974. That section, which has been invoked only rarely, is also known as a "global safeguard investigation" and applies not to specific countries but imports from all countries. A Section 201 case has been successfully brought only once this century, to protect the U.S. steel industry against imports in 2001. The industry must persuade the ITC that imports are arriving in such quantities that it constitutes "serious injury" to an industry. This bar is higher than the "material injury" that forms the basis of most actions by the ITC. Material injury, for example, was the occasion for anti-dumping tariffs that were imposed on Chinese and Taiwanese solar makers in 2012. Material injury cases have to result in a finding from the ITC that the imports were unfair. Serious injury cases don't have to meet that bar of unfairness but must establish that the imports were a "substantial cause" of injury. In reality, the difference between "serious injury" and "material injury" can be hard to parse, said John Herrmann, a trade lawyer who worked on trade and energy issues on the National Security Council under President George W. Bush. "The ITC will interpret it as a higher standard than in an ordinary case," he said. The differences in what happens next, however, is clear. Ordinary cases before the ITC are decided in alternating phases by the ITC and the Commerce Department. But Section 201 cases go directly to the president, in collaboration with the U.S. trade representative. The president may endorse the ITC's recommendations, do something else entirely or do nothing. "At these stages those remedies become very political," Herrmann said. The ITC is required to make its finding within 150 days and must send its recommendation to the president within 180 days. That would put Suniva's petition on Trump's desk by late October. The solar industry will have chances to weigh in through written statements and hearings. The ITC is by law a bipartisan body, made up of three Democrats and three Republicans who serve nine-year terms, nominated by the president and confirmed by the Senate. If a seat is vacated by a member of one party, it must be filled by a member of the same party. That's how it came to be that President Obama ended up putting three Republicans on the commission. In theory, Trump could name three commissioners to the ITC by next month. Currently, one Republican seat is vacant; one commissioner, Democrat Irving Williamson, is serving beyond the end of his term for want of a replacement, and another, Republican Meredith Broadbent, has a term ending next month but is expected to stay on. Trump, however, has been slow to fill much more senior positions in the government and has not nominated anyone to the ITC. The ITC's design, meant to resist political pressure, has worked more or less as intended, Herrmann said. "In many cases they don't take particularly kindly to being pressured to arrive at a certain conclusion," Herrmann said. Hopper, the president of the SEIA, said the industry isn't yet clear where it stands on the Suniva issue. "We are figuring out what fighting this means," she said. A tweet by the SEIA on Thursday, however, might provide a preview. "Suniva's trade petition is a blunt instrument that can damage the #solar industry w/o helping Suniva," it said. Asked about the prospect of Trump raising tariffs that could alter the face of solar, she referenced the solar panels that Obama had installed at the White House early in his second term. "Donald Trump decided to leave solar panels on the White House," Hopper said. "So that's a good sign."